Shocked vets have delivered a kitten with two faces. 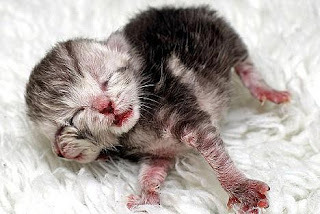 The kitten can only eat with one of its mouths, due to a cleft palate - but it meows simultaneously through both. The only member of an otherwise normal litter of three, it is said to be doing well. It was born in the vet's surgery after its mother developed complications during the birth. 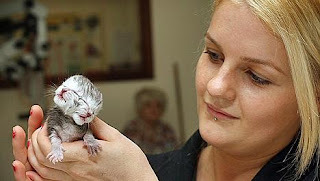 Nurse Louisa Burgess, who delivered the kitten in Perth, Western Australia, with vet George Huber, said she had never seen a two-faced cat in 12 years of working in animal health. 'I have seen cats with two tails and extra legs, but not this,' she said. 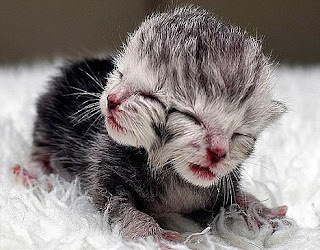 One in a million cats is born with two heads. The owners plan to keep the kitten and are said to be considering calling it Mr Men or Quasi Modo, according to Australian website InMyCommunity.com.au. By coincidence there has been another report of a two-faced kitten in the US this year. Born in Texas in February, it was part of a litter of seven. In August a kitten with four eyes, two noses and one mouth was born in Ohio, but it died after five days.